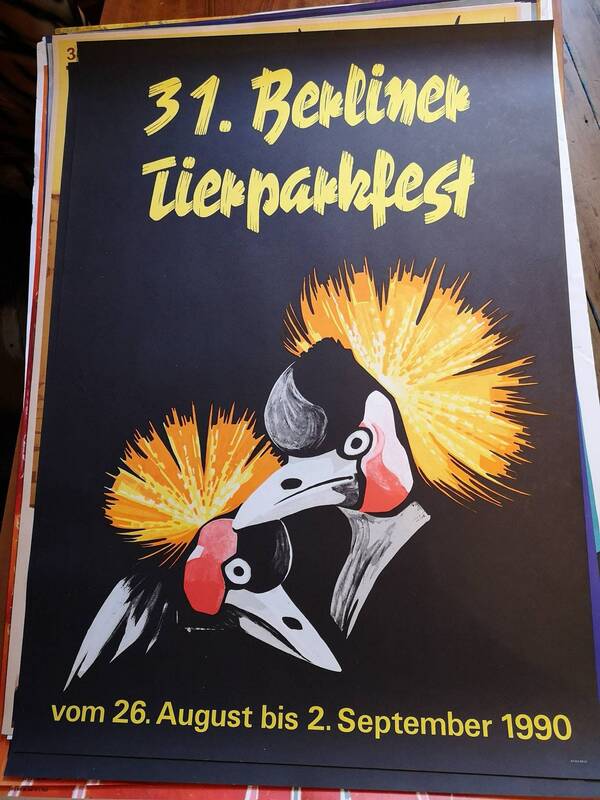 These amazing original ( not reproduction ) Communist era advertising prints of the Tierpark Berlin zoo all designed by various artists of the era. In amazing vintage mint condition, but due to age there may be very small hardly noticeable creases on some of the edges. The Tierpark Berlin is Europe's largest adventure animal park. It is one of two zoos located in Berlin, Germany. It was founded in 1955 and is located in Friedrichsfelde on the former grounds of Friedrichsfelde Palace, which is situated within the zoo. Founded in 1955, it was originally established as a counterpart of the famous Berlin Zoological Garden, which was located in what was then West Berlin and soon to be out of reach for residents of the former eastern sector. Size A1, Height 84.1cm, Width 59.4cm. You are more than welcome to purchase this item in person & pick it up from our London based workshop.